As a PoC growing up, I often struggled to find myself within the genre’s tomes. For the most part, I made it in as some antisocial Haradrim driving my Mumakil at the Battle of the Pelennor Fields, (“out of Far Harad black men like half-trolls with white eyes and red tongues.”) Or perhaps I was the only decent “ebon-skinned” darkelf in the Underdark (one of the good ones). That was pretty much my choices. Either I was some “othered” being that would make Edward Said side-eye (*cough* Orientalism), or I did not exist at all. Over the years, demands for more meaningful diversity in our fantasy realms have grown increasingly louder–a clarion call that echoes from the mundane world to haunt our usual lands of elves, dragons, orcs and what-not. 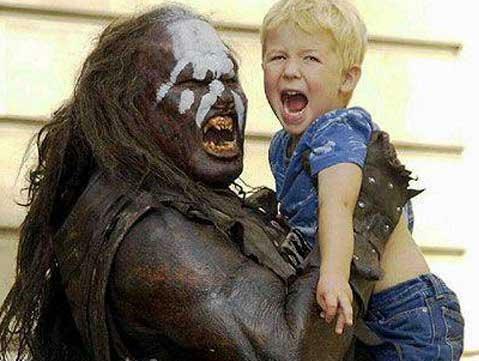 When local New Zealanders were told they were “too dark to be a Hobbit” (no one’s ever too dark to be an Orc i it seems) it caused a stir, highlighting the at times “unbearable whiteness” of the heroes of Tolkien’s masterpiece. Both Pixar’s Brave and Disney’s Frozen were criticized for their similar ode to all things vanilla, without even attempting a hint at color. Of course, I’ve been hearing these same excuses Martin trotted out since I was a kid. Of course there are no black people in my land of ladies, horse lords and knights–because there were no black people there. Only there are two really convenient replies. (1) Well there were no dragons, hobbits or elves either. You made that sh*t up. That’s what fantasy is you know–sh*t we make up. So if you can toss in a talking dragon, you can toss in a PoC. Easy-peasy. And (2), what has become an increasingly stronger reply: “you don’t know history or geography as well as you think you do.” Turns out, none of these Euro-spaces in our reality were ever lily-white. The fantastic site People of Color in European Art History (medievalpoc) has been destroying this hallowed myth one painting and statue at a time. Oh, and George, that African noblewoman found in Roman era York might just beg to differ on just who was and was not in that space. IJS. But this blog isn’t really about GRRM or the whiteness of mainstream fantasy. To be clear, I think these are important discussions to have. I wholly support the calls for greater inclusion and diversity in fantasy from EVERYONE–and believe scrutiny should be placed on the more popular fantasy books and films that are becoming commonplace in our media. Nobody gets off the hook…George. At the same time however, it’s important to remember that lands of fantasy exist beyond Westeros. Beyond Middle Earth, or the usual Eurocentric fantasy worlds that fill our bookshelves, there are other imagined realms by artists, authors and other creators–just waiting to be explored. 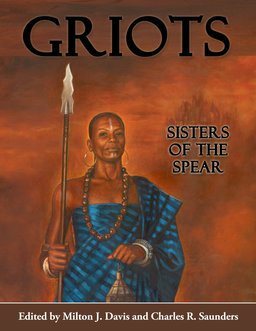 Sisters of the Spear does exactly that, featuring seventeen tales by diverse authors of fantasy (some established, some new) with all the heroic deeds, myth, monsters and magic for which a more diverse audience has been clamoring. Included in its pages is a story by Charles Saunders himself, a tale of his recurring warrior heroine Dossouye. Alongside this are stories of women battling succubus-spirits and were-rhinos, women who sail alongside pirates and become embroiled in political intrigue, women who sing magic and travel to islands of winged-men, and so much more. Ayen is a young widow who is haunted by the destructive spirit of her husband. She has ventured deep into the wasteland in search of a wise-woman who can sever her dead spouse’s hold on her. Clark…has written a powerful story of sorrow, remorse, and giant world-shattering monsters. Piqued your interest? Intrigued? Of course you are! There are black women in here doing awesome fantastic things and being fantastically awesome while doing it! You want to read this anthology! You have to read this anthology! This is what we’ve all been asking for isn’t it? Strong Complex women characters? Settings outside of Europe? Enough with the elves and dwarves already? DiversityinSFF? Well here it is. Specially made just for you. ALL of you. ALL of us. Because while I enjoy stories of Daenerys, White Walkers and Red Weddings as much as the next fantasy geek, we ALL need to move BEYOND WESTEROS. Get Griots on Amazon in ebook ($4.99) and paperback ($20) formats. You can also get it in paperback directly from the publisher, Milton Davis. This entry was posted in Uncategorized and tagged A Song of Ice and Fire, Africa, Charles Saunders, diversity, fantasy, folklore, Griots, GRRM, non-Western, Orientalism, Race, Sisters of the Spear, Speculative Fiction, Sword and Soul by The Disgruntled Haradrim. Bookmark the permalink. thanks for the plug and thanks for the story. Milton D. and Charles S and the authors in both Griots collection are doing tremendous work to enliven/revivify a genre in need of both those things. As a white male Australian who grew up with a lot of friends from Africa I was often asked by them why there didn’t seem to be any black people in the fantasy stories I loved as a kid. I usually gave the feeble excuse that the predominantly white writers were just too unfamiliar with black culture. As I got older I realized that mostly they were too lazy to do any research or to look beyond the Eurocentric world view that most white people buy into and never question. Lately I’ve noticed that some white fantasy authors are including more dark-skinned main characters, so maybe things are changing. 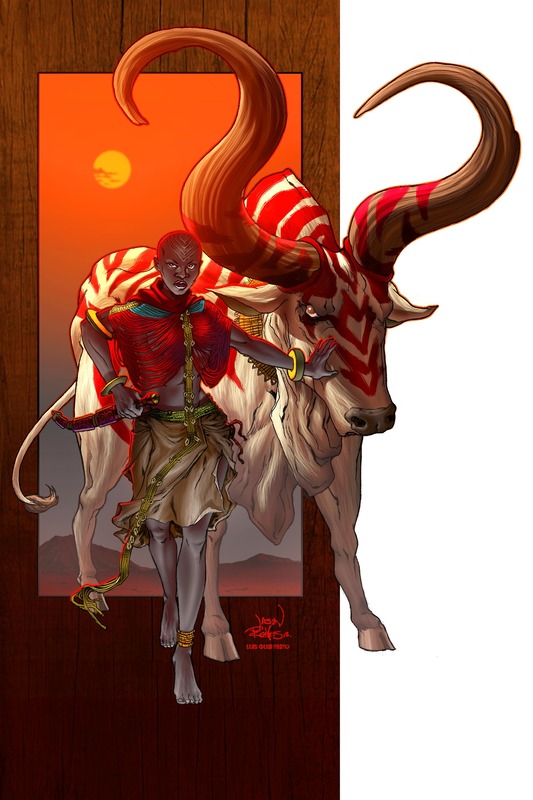 The picture of your character Ayen (which looks awesome by the way) reminded me straight away of South Sudanese cultures which is a pretty fascinating source for a fantasy story (we have a lot of Dinka refugees living in Australia now). Anyway I just wanted to say that I think that the more diverse fantasy becomes the better it will be and I really admire what you are doing. Also my sister has often observed in the past that female characters in fantasy are portrayed in boring or non-important ways, so I guess you get even more points for pushing boundaries in that direction too. Respect to all of you for being willing to do something different from most of the other fantasy writers out there. Thanks for the comments! Much appreciated. 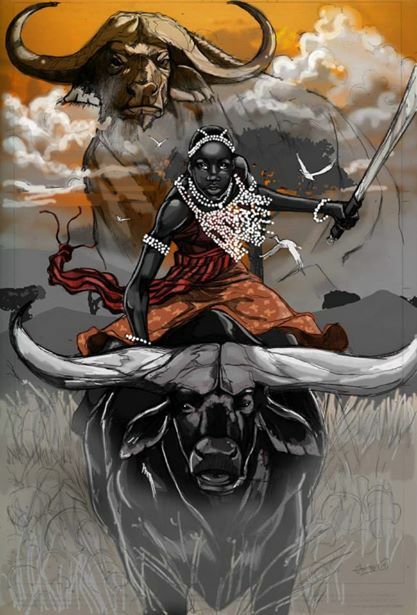 You picked up quite well on the South Sudanese (Dinka) inspiration for the image “Ayen and Bull.” Didn’t realize there was a significant Dinka population in Australia; likely emigrated due to the upheavals in South Sudan in the past few decades. Interesting! Hope you get a chance to check out the book. Because fantasy can be based anywhere!